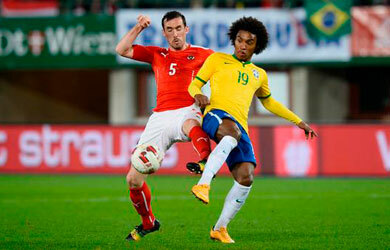 Austria will try to withstand Brazil in a friendly game of football for national teams prior to the 2018 World Cup. The mentioned event to be held at the Ernst-Happel-Stadion in Vienna, an Austrian city. Our prediction deployed further. Das Team has almost all its 26 players called on this set of friendlies available, except injured defender Andreas Ulmer. The lineup doesn't differ much from the one that missed the pass to Russia during the last World Cup qualification campaign. The main change is the coach. Unfulfilled Swiss manager Marcel Koller was replaced by German-Franco Foda. The latter kicked out of the Austrian squad just a few old boys like defender Florian Klein, midfielders Martin Harnik and Zlatko Junuzović, as well as striker and vice-captain Marc Janko, adding some fresh and younger faces mostly from the three local Bundesliga clubs: Sturm Graz, Rapid Wien and Red Bull Salzburg. The Austrians have failed to qualify for 5th Mundial in a row. Their last presence at World Cups dated back to 1998. However, it seems that Austria has been shaped with a better form than a plenty of possessers of tickets to Russia this summer. Coach Franco Foda has led his troops to 7 wins in a row so far, including an impressive defeat caused by the Austrians to the current world champions title holders, Germany, 2:1 on June 2. So, for the ultimate test, it hardly would be possible to find a better and more proper touchstone for Brazil than Austria with their current state and confidence. The Brazilian Seleção has also enjoyed a nice string of results. Such a stable and well-balanced team like Tite has crafted during his two years of work, this football nation wasn't fortunate to witness for past decades. The South Americans have been considered as main favorites of World Cups before almost every single competition but now it has much more sense than any time before in the new history. The Brazilians have lost only once in 20 matches under Tite's guidance. It was a "Superclásico de las Américas" exhibition match against their fierce rivals Argentina in Australia exactly one year ago (0:1). Moreover, besides the nice scoring abilities, this generation of players has developed enviable defensive abilities. Goalkeepers Alisson, Ederson and their fellows have enjoyed clean sheets in 2 of every 3 fixtures. After Argentina, only Japan and Colombia have been able to find the net against the Pentacampeões so far.